Draft: 2005, Atlanta Braves, 2nd rd. Yunel (yoo-NEL) Almenares Escobar. Came to the United States in 2004 at the age of 21... Spent three days at sea, leaving his family behind in Cuba... In January 2007, father and 10-year-old sister came to the United States followed by his mother in June. Posted a .304 average in fi rst season with Angels, good for ninth in the American League...Was just the third Angels third baseman to hit .300-or-bett er in a single season, joining Doug DeCinces - .301 in 1982 and Chone Figgins - .330 in 2007...Established a new career high with 28 doubles... Highest total by a Halo third baseman since Chone Figgins' 30 in 2009...In 78 games during the fi rst half, hit .317 (100/315) with 21 doubles, three home runs, 27 RBI and 37 runs scored…The .317 average was the highest in franchise history by an Angels third baseman before the All-Star Break...Was just the third Angels third baseman with 100 hits before the All-Star Break: Carney Lansford - 115 H in 1979 and Chone Figgins - 103 H in 2009 and the only with 100 hits and 20 doubles before the break. In first season with Washington, hit a career best .314 (168/535) with 25 doubles, a triple, nine home runs and 56 RBIs... Also set a career high with 168 hits. Ranked in the National League's Top 10 in average (6th), on-base percentage (.375, 7th) and multi-hit games (49, 8th)... Led N.L. third baseman in average, on-base percentage and finished third in fielding percentage (.970)... The .970 fielding percentage was tops in franchise history by a third baseman. His .314 average was the highest single-season average by a third baseman (min. 500 AB) in franchise history while the 168 hits ranked seventh... Joined Ryan Zimmerman (2010) and Larry Parrish (1979 with Montreal) as the only third baseman to hit .300 with 25 doubles in a season in Club annals. Tallied three 5-hit games... Was the only player in the Majors with more than one... The last player with more such games was Ichiro Suzuki (4) in 2004. Made his seventh consecutive Opening Day start at shortstop (2008-10 with ATL, 2011-12 with TOR, 2013-14 with TBR)...Appeared in 137 games, his fewest since 2011, due to right shoulder soreness that sent him to the 15-day DL (June 30-July 11) and a left-knee sprain in mid-Sept. that would end his season prematurely...Hit .258 with 18 doubles, seven homers, 39 RBI, 43 walks and 33 runs scored... Batted .290 (65-for-224) on the road, 60 points better than at home (.230)...Hit .383/.431/.638 (18-for-47) over his last 14 games, (Sept. 5-23), with six extra-base hit (3 2B, 3 HR) and eight RBI…Suffered a left knee contusion sliding into home plate on Sept 23 at BOS, and was sidelined the remaining five games...Collected his 1,000th major league hit on May 22 vs. OAK, an RBI single...Went a career-high 64 consecutive plate apps without a strikeout, June 9-July 13... On Sept. 6 vs. BAL scored the winning run on a walk-off passed ball by Nick Hundley, the first walk-off win in TBR history on a passed ball...Had his first career multi-HR game, Sept. 11 at NYY, with a season-high four RBI, his most since Aug. 29, 2012 at NYY (with TOR)…Became only the second Rays shortstop to record a multi-HR game, joining Julio Lugo (three times, last July 22, 2006 vs. BAL)…That home run snapped a 57-game homerless drought, second longest of his career…Became the second visiting shortstop to have a multi-HR game at new Yankee Stadium, joining NYM Jose Reyes (June 19, 2010) and the seventh visiting SS to do it against the Yankees: Nomar Garciaparra (BOS, 1999 & 2002), Alex Gonzalez (TOR, 2001), Mike Bordick (BAL, 2001), Vern Stephens (STL-AL, 1943) and Billy Rogell (DET, 1935). he batted .421 (8-for-19), 2nd highest in the 2013 postseason among all players (min. 10 AB) behind ATL Chris Johnson (.438) and the highest ever by a Ray in postseason... Hit .467 (7-for-15) in the ALDS vs. BOS, 2nd best in the ALDS in club history behind Carlos Peña (.500 in 2008 vs. CWS)... Became the first Ray to have three straight multi-hit games in the postseason…included was a 3-hit effort in the Rays 3-1 loss in Game 4 of the ALDS, in which he had half of the Rays 6 hits. Played in a career-high 145 games for Toronto,including 140 starts at shortstop, in his sixth major league season...at the plate, recorded career-lows with a .253 avg. (141-for-558) and.300 OBP...Compiled a .982 fielding percentage, fourth best among major league shortstops, and committed only 12 errors...only BAL J.J. Hardy (.992), DET Jhonny Peralta (.988) and SEA BrendanRyan (.985) fared better...also ranked fourth among major league shortstops in putouts (240) and assists (431)...ranked third with 683total chances...According to Stats Inc., his .868 zone rating led all major league shortstops...zone rating measures the percentage of outs made on groundballs hit into his defensive "zone. "...Hit .290 (58-for-200) with five HR in 52 day games, compared to .232 (83-for-358) with four HR in 93 night games...Hit .320 (33-for-103) when batting in the No. 2 hole, compared to .237 (108-for-455) everywhere else...Had three four-hit games, each tying his career high, on April 18 vs. TB, May 10 at MIN and Aug 29 at NYY...on Aug. 29 at NYY had four extra-base hits (3-2B, 1-HR), tying the Blue Jays record, and his 5 RBI that day tied his career high...this also tied for the most extra-base hits ever against the Yankees (16th time, last LAA Garret Anderson, Aug 21, 2007)...Grounded into 21 double plays, tied for seventh most in the AL...In September served a three-game suspension issued by the team due to an unacceptable message displayed on his eyeblack during a game...Following the season was traded twice in a span of two weeks...acquired by Miami on Nov. 19 in a 12-player trade with Toronto involving SS Jose Reyes, RH Josh Johnson and LH Mark Buehrle...acquired by the Rays on Dec. 4 in exchange for minor league INF Derek Dietrich. Appeared in 133 games in his 1st full season with the Blue Jays... MR. CONSISTANT: In the first half of the season hit .291 with 14 doubles, three triples and 31 RBI in 83 games... In the second half he hit .290 with 10 doubles, two triples, and 17 RBI... REAL HOMER: Hit .321 with 22 extra-base hits (12-2B, 2-3B, 8HR) and a .416 OBP at home... WALKOFF FASHION: Hit his 2nd career walk-off home run Apr. 5 vs. OAK in the bottom of the 10th inning off Grant Balfour... ON BASE MAN: Was 3rd in the ML and 1st among AL among shortstops with a .367 OBP and led all AL shortstops with 60 walks despite playing in only 132 games... Since 2007 is 4th among ML shortstops with a .362 OBP (Ramirez, .386)... Reached base safely in 59 of his last 67 games and 109 of 133 games overall... Reached base safely in 25 straight games, which was a career high from June 18-July 20... LEAN LEFT: Was 6th in the AL with a .330 average (38-for-115) with nine doubles, two triples and three home runs vs. left-handed pitching... SIGN 'EM UP: Was signed to a two year contract extension with a Club option for the 2014 and 2015 seasons on June 19... PREMATURE END: Was hit on the left elbow on Sept. 10 vs. BAL and was placed on the 15-day DL with a swollen left elbow (retro Sept. 11) and was did not appear in a game after that date... Also missed four days after being hit in the hand on July 1 vs. PHI... Returned to the lineup on July 6 at BOS and collected four hits... Missed two games in April due to a mild concussion... BIG DAYS: On Aug. 31 and Sept. 1 vs. BAL, became only the 5th Blue Jay to record back-to-back four-hit games... VROOM VROOM: Was named HONDA Player-of-the-Month for July by the Toronto Chapter of the BBWAA after posting a .367 average and a .462 OBP, including six doubles... STREAKING: Matched a career high 12-game hit streak May 20-31, his 2nd career and marked the longest by a Blue Jay last season. Appeared in 60 games with the Blue Jays last season after being acquired from Atlanta along with LHP Jo-Jo Reyes for SS Alex Gonzalez, Tim Collins and Tyler Pastornicky on July 14... Overall batted .256 with 19 doubles, four home runs and 35 RBI in 135 games for the Braves and Blue Jays... GRAND START: On July 18 became just the8th player to have his first home run as a Blue Jay come as a grand slam... Matched his career high of five runs battedin during that game... Was the first grand slam by a Blue Jays SS since July 25, 2006 at SEA (John McDonald)... Failedto homer in his first 353 at-bats this season with ATL, yet hit two home runs in his first four games (20 at-bats) as a BlueJay... STREAKING: Began his Blue Jays career with a season high 10 game hitting streak from July 16-27 which was thethird longest streak to begin a Blue Jays career in Club history (Dave Martinez, 21GM-'00 and Roy Howell, 15GM-'77)...Collected four hits on Sept. 17 at BOS, matching his career high... MR. CONSISTANT: Reached base safely in 46 of his60 games as a Blue Jay... RAISING HIS GAME: Was at his best vs. AL East opponents, batting .322 with a .770 OPS in36 contests... Batted .324 when swinging at the first pitch in an at-bat... PAIN IN THE BACK: Missed seven games fromAug. 29-Sep. 5 with a stiff back. Set career highs in games (141), at-bats (528), runs (89), hits (158), doubles (26), home runs (14) and RBI (76) as the Braves' everyday shortstop...His .373 avg. (50-for-134) with RISP tied for second in the NL and third in the Majors (min. 100 ABs)...With the bases loaded, hit .444 (4-for-9) with 11 RBI...His .327 batting average vs. RHP ranked fourth in the NL. He hit .232 (36-for-155) with four home runs and 19 RBI off LHP...Led the Braves with 46 multi-hit games and ranked second in multi-RBI games (20), two-out RBI (38) and GW-RBI (9)...His .356 (26-for-73) July batting average ranked fifth in the NL (min. 50 ABs)...Became the first right-handed batter in 2009 to hit a home run off NL Cy Young winner Tim Lincecum with his two-out, three-run shot in the third inning on 7/22...Named NL Player of the Week for 7/16-19. He went 7-for-14 (.500) with three doubles and two home runs in the four-game series vs. NYM. It was his first career weekly award...Returned to the starting lineup on 7/16. His 2nd-inning HR teamed with G. Anderson's HR to mark the first time in '09 ATL hit consecutive HR in a game...Grounded into a team-high 21 double plays...Had a career-best 46-game errorless streak from 6/30-9/28. He made just two errors in his final 75 games in the field (since June 30)...Had three final at-bat victories: a game-winning sac. fly in the bottom of the ninth of 5/15 win over ARI, an RBI single in the bottom of the 8th vs. MIL and an RBI single in the top of the 12th inning on 8/7 at LAD...Hit .344 (16-for-44) with one home run and two RBI during a season-high 11-game hitting streak 8/16-27. Played first full season at the major-league level, setting career highs in games (136), at-bats (514), hits (148), home runs (10), RBI (60), walks (59) and strikeouts (62). ...Ranked fourth on the team with 42 multi-hit games. ...Batted .289 (84-for-291, 3 HR) in 73 games from the #2 spot in the lineup. Also batted leadoff 40 times (45-for-158, .285, 4 HR)....Hit .313 (81-for-259) at home and .263 (67-for-255) on the road....Was a .299 hitter vs. RHP (109-for-365) and a .262 hitter vs. LHP (39-for-149)....Tied the Atlanta record for most GIDP in a season with 24 (Murphy '88, A. Jones '04). On 8/29 at WSH,he grounded into three double plays, matching the single-game franchise mark set by Walt Cruise, 9/18/21vs. CIN & Joe Adcock, 7/20/55 vs. PIT....Had 11-game hitting streak (17-for-44) snapped 9/14 with a PH at-bat....Suffered a strained right hamstring in Gm 1 on 9/13 at NYM and did not start another game or play in thefield again. He made three plate appearances as a pinch hitter the remainder of the season....Had a team-leading 15 RBI in August....Over his last 38 games, dating to 8/7, he was 40-for-122 (.328) with 4 HR, 7 2B & 15 RBIs....Hit his third career leadoff HR (2nd this season) on the first pitch on 8/21 off NYM's P. Martinez. It was hisfirst HR since 6/5 vs. FLA, a span of 213 ABs....Snapped an 0-for-13 hitless streak (2-for-4, 1 HR, 1 2B) and matched his career high with 3 RBI (last7/23/08 at FLA) on 8/31 at WSH....Returned on 7/22 at FLA after missing the previous seven games with a left shoulder strain. Had an MRIexam on on 7/14 which showed inflammation to his left rotator cuff....Suffered a left shoulder strain on 6/24 vs. MIL while diving back into 1B....Hit his first career game-ending home run in the 10th inning on 6/2 vs. FLA off Logan Kensing....Hit his second career leadoff HR (last: 8/29/07) on 5/14 off PHI's Brett Myers....Had career-high 12-game hitting streak from 4/6-19 (16-for-49, .327)....Went 3-for-4 on 3/31 vs. PIT with his first career triple and 3 RBI and 2-for-4 on 4/2 vs. PIT with his firsthome run of the season and three more RBI....Provided go-ahead HR in the sixth inning on 4/11 at WSH. Had an outstanding rookie year, hitting .326 in 94 games with Atlanta after his 6/2 promotion from Richmond (AAA). Was named by Baseball America as the eighth-best prospect in the International League. His 104 hits after his debut on 6/2 ranked as the ninth most among MLB rookies. His .336 batting average after the All-Star break was fourth among all major league rookies (2nd in NL) and17th overall in the NL. He hit .304 before the break. Led all major league rookies with a .352 avg. in August (37-for-105). Played 53 games at shortstop, 22 games at third base and 21 games at second base. Hit .355 vs. LHP (50-for-141) and .303 vs. RHP (54-for-178). Hit .331 at Turner Field and .322 on the road. Was a .333 hitter with runners in scoring position (20-for-60). Hit .355 vs. NL East clubs, including .475 in 11 games vs. FLA (19-for-40). Had 33 multi-hit games in 88 contests with an at-bat (37.5 pct.) Hit .448 (13-for-29) during his season-best seven-game hitting streak (8/23-29). Went 18-for-43 (.419) on the 8/20-29 road trip and hit his first career leadoff homer off DontrelleWillis on 8/29 at FLA. Collected the game-winning walk-off hit in the 10th inning on 8/5 vs. COL. Matched career high with four hits and set a career high with four runs 6/27 vs. WSH. Had a two-run, game-winning double in the ninth inning on 6/15 at CLE, also his first multi-RBI game. Went 4-for-4 with his first career HR in the fourth inning on 6/4 vs. FLA. Made his Major League debut on 6/2 at CHI with a 2-for-4 game and had the game-winning RBIwith a double in the 8th inning. In 46 games at Richmond, hit .333 (60-for-180) with 2 HR and 29 RBI. His .333 avg. ranked seventhin the IL and he was 7-for-9 in SB attempts. Named as the Best Infield Arm and Best Defensive SS in the International League by Baseball America. Was Richmond's April Player of the Month, hitting .313 with a homer and 12 RBI with 3 2B and 4 SB. Named Mississippi (AA) Player of the Month for the month of June by the Atlanta Braves organization (.298, 10 doubles, one home run and 11 RBI)...Led Mississippi with 121 games, 428 at-bats, 55 runs scored, 113 hits, 21 doubles, 25 infield hits and tied for first with four triples. Ranked second on the team with 45 RBI and 59 walks...Was named the Mississippi Player of the Year by the Atlanta Braves organization...Named by Baseball America as the Braves' 10th-best prospect following the season and one of the top fiveprospects by Sports Weekly...Named as one of the 50 players for the 2006 Futures game and played for the World Team against theUnited States on 7/9 at PNC Park in Pittsburgh. Played third base and went 0-for-1 with a walk...Went 2-for-3 with a double, two RBI, and a stolen base in his AA debut on 4/6 vs. HVL...Went 3-for-6 with three doubles, two RBI, and two runs scored on 5/5 at MTG...Had an eight-game hitting streak, 4/29-5/9 (13-for-33, .394)...Hit his first homer of the year to lead off the 11th inning on 5/19 at JAX. Braves won 4-3...Had his second three-double game on 6/2 at CAR with an RBI, and two runs scored...Recorded the 150th hit of his career on 6/28 vs BIR. Went 2-4 with two doubles on the night...Placed on the disabled list on 7/18. Activated from the disabled list on 7/26 with a left elbow contusion anda fractured right heel...Won the 2006 Arizona Fall League batting title, hitting .407 in 86 at-bats. Rated by Baseball America as the No. 3 overall prospect in the Braves organization...Had a 12-game hitting streak 6/21-7/3 (.378, 17-45), combined between Danville and Rome...Reached base via hit or walk in 26 consecutive games 7/7-8/5...Hit .325 (38-for-117) with eight doubles, two triples, two homers, and 10 RBIin July...Led Rome in July with 38 hits...Recorded a combined (Danville and Rome) 19 multi-hit games...Made just six errors in 48 games with Rome...Ranked fourth in the Braves organization with an OPS (On-base percentage +Slugging percentage) of .912...Went 5-for-8 with two doubles, four RBI, and five runs scored on6/25-26...Had a 10-game hit streak from 7/7-7/17...Went 4-for-4 with a double, a homer, two RBI, and tworuns scored on 7/14...Went 6-11 with two doubles and three runs scored from 7/23-26...Went hitless in back-to-back games only once in 2005...Had his best month in July when he hit .325 with eight doubles, two triples,two homers, 10 RBI, and 18 runs scored. December 27, 2018 Toros del Este placed 3B Yunel Escobar on the reserve list. November 26, 2018 3B Yunel Escobar assigned to Toros del Este. 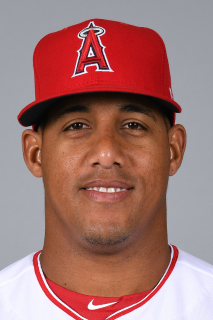 November 2, 2017 3B Yunel Escobar elected free agency. October 2, 2017 Los Angeles Angels activated 3B Yunel Escobar from the 10-day disabled list. August 29, 2017 Los Angeles Angels sent 3B Yunel Escobar on a rehab assignment to Inland Empire 66ers. August 8, 2017 Los Angeles Angels placed 3B Yunel Escobar on the 10-day disabled list. Right oblique strain. June 1, 2017 Los Angeles Angels activated 3B Yunel Escobar from the 10-day disabled list. May 31, 2017 Los Angeles Angels sent 3B Yunel Escobar on a rehab assignment to Inland Empire 66ers. May 15, 2017 Los Angeles Angels placed 3B Yunel Escobar on the 10-day disabled list. Left hamstring strain. September 2, 2016 Los Angeles Angels activated 3B Yunel Escobar from the 7-day disabled list. August 20, 2016 Los Angeles Angels placed 3B Yunel Escobar on the 7-day disabled list. Concussion. January 14, 2015 Washington Nationals traded RHP Tyler Clippard to Oakland Athletics for 3B Yunel Escobar. July 11, 2014 Tampa Bay Rays activated SS Yunel Escobar from the 15-day disabled list. July 8, 2014 sent SS Yunel Escobar on a rehab assignment to Charlotte Stone Crabs. July 7, 2014 Tampa Bay Rays sent SS Yunel Escobar on a rehab assignment to GCL Rays. December 4, 2012 Miami Marlins traded SS Yunel Escobar to Tampa Bay Rays for 2B Derek Dietrich. September 21, 2012 Yunel Escobar roster status changed by Toronto Blue Jays. September 18, 2012 SS Yunel Escobar suspended. August 25, 2012 Toronto Blue Jays activated SS Yunel Escobar from the paternity list. September 29, 2011 Yunel Escobar roster status changed by Toronto Blue Jays. September 20, 2011 Toronto Blue Jays placed SS Yunel Escobar on the 15-day disabled list retroactive to September 11, 2011. Sore left elbow. July 16, 2010 SS Yunel Escobar assigned to Toronto Blue Jays. May 15, 2010 Yunel Escobar roster status changed by Atlanta Braves. May 14, 2010 sent SS Yunel Escobar on a rehab assignment to Gwinnett Braves. May 4, 2010 Atlanta Braves placed SS Yunel Escobar on the 15-day disabled list retroactive to April 30, 2010. Left groin strain.